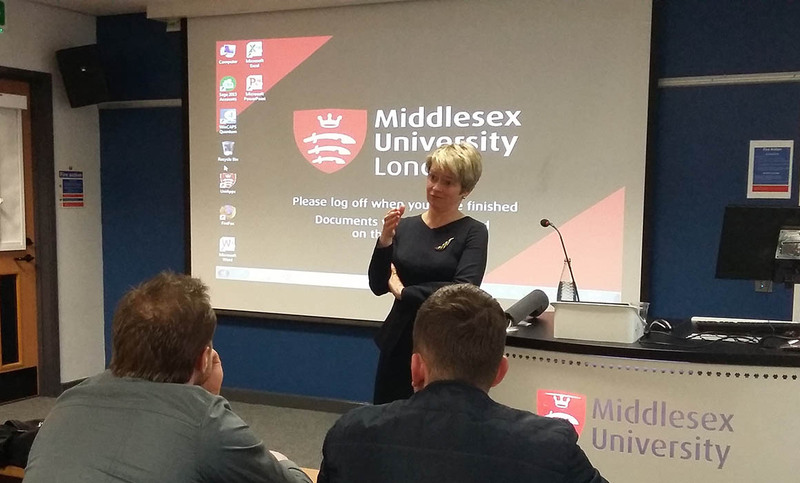 Member of the House of Lords and former CEO of TalkTalk, Dido Harding, delivered an expert public lecture at Middlesex University on 2 May on the coming 4th industrial revolution and its potential impact across business, public policy and wider society. In recent years Dido Harding has been named repeatedly as one of the most powerful women in the UK by BBC Radio 4’s Woman’s Hour. During the lecture Dido drew upon her experience from the worlds of business and public service to highlight future challenges and opportunities for the country. “The 4th industrial revolution or digital revolution is transforming much more than our economy and pure economics,” she said. “The digital revolution is changing politics, it’s changing the way we fall in love and pretty much every element of our lives. Dido Harding has occupied senior positions with many of the country’s best known companies including Thomas Cook, Woolworths, Tesco, Sainsbury’s and most recently as the Chief Executive of Talk Talk. She serves as a non-executive director of the Court of the Bank of England and sits on the boards of British Land and Cheltenham Racecourse. In 2014, she was made a life peer in recognition of her significant contribution to the world of business.